I knew I wanted to be a pro cyclist when: I started to properly race in 2007, before that I was an amateur for a number of years. It was in this time that I decided I wanted to try and become a professional cyclist and I joined a Portuguese Continental team in 2011. Greatest racing memory: My first professional victory on Stage 5 of the Volta ao Algarve in 2017. I attacked on the final climb and was able to take the win after riding solo in the final kilometers. It was really special for me because I was racing on home soil, in my own city. All my friends were there on the side of the road. It was a big and important moment in my career. The race I dream of winning: A stage at any of the three Grand Tours. It would be an incredible feeling. If I wasn't a pro cyclist: I can’t imagine not being involved in sport, so if I wasn’t a professional cyclist I think I would still like to work in that environment in some way. After racing for seven years, Amaro Antunes stepped up to the professional ranks in 2018 following a standout 2017 season that saw him prove his climbing abilities by claiming stage wins on summit finishes at Volta a Portugal Santander and Volta ao Algarve against some of the world’s best racers. 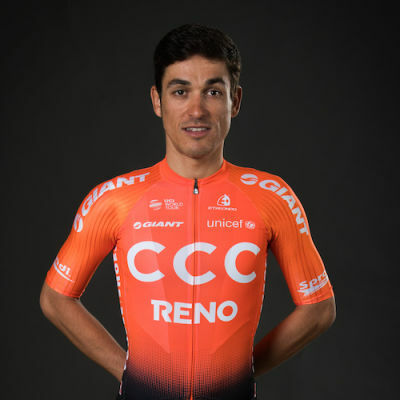 Antunes make his UCI WorldTour debut with CCC Team in 2019.